Q4 will be over before you know it, and you know what that means for so many companies: it’s performance review time! For some of you, you’re groaning and shaking your heads — wishing you didn’t have to go through this burdensome process. Others are feeling relieved because your company has done away with formal performance reviews. 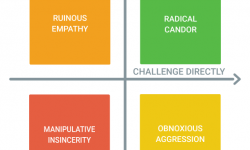 We all know that the Performance Review gets a bad rap, but are they all bad? There’s an interesting trend of companies starting to abandon the semi-annual or annual formal performance review process. GE, who has been recognized in the industry as a pioneer of formal performance review processes, is also leading the way in re-evaluating the approach. Experts and surveys have reported that annual performance reviews are time-consuming (and therefore expensive) and don’t work for achieving great performance across a company. Many companies are questioning and scrapping their annual review process in favor of more frequent, continuous feedback. We’re all about impromptu feedback, but jettisoning formal performance management processes isn’t always necessary or a good choice for every company. So many companies, as a part of the formal process, use a numerical rating to help distribute scarce resources, such as pay increases, promotions, and stock grants. The process of scoring people and calibrating those scores among managers within larger organizations is absolutely imperfect, but it is the best I’ve seen at helping leadership make fair and equitable decisions about the distribution of scarce resources. If you were to jettison your performance management system altogether, you would need to do something to replace this process, and that can be tricky and time consuming. Another reason to hang on the performance reviews is that a company can be assured that at least a couple times per year everyone in the enterprise is getting some kind of feedback. It’s almost like a top-down quality control step. That feedback might be uneven, might suffer from the issues I mention below, but at least there is some kind of evaluation happening. “If this is all you have happening, that’s a problem, but it’s certainly better than nothing,” says John Allain, a forward-thinking Director of HR at Continental Properties Company. It’s possible to neutralize some of the problems with semi-annual/annual performance management processes without abandoning them completely. Instead of getting rid of performance reviews, some companies may want to focus on adjusting their processes to achieve a better outcome. 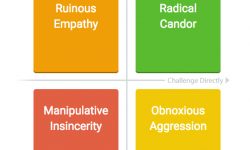 Because we at Candor believe that feedback is a crucial part of success for managers and teams, I’m going to focus on some of the feedback process issues that performance reviews introduce. If you are aware of these issues and some ways to solve them, you can undo the damage that the annual performance review has on your feedback processes. Review cycles are designed to be 6 months or 12 month review periods, but very often the feedback is heavily focused on the last 6 weeks or so. This isn’t crazy, but can feel unfair to employees who feel like that had a big achievement way back in the review period. Think about the formal review process as a chance to tease out persistent themes for both Strengths and Areas for Development. Think about the Situation, Behavior, and Impact model for feedback and recurring patterns based on examples from the review period. To help generate these themes, it can be helpful to take notes throughout the review period that you can reference to remind yourself what was happening and avoid the emphasis on the most recent several weeks. In addition, when putting together the review, review your calendar and create a list of key accomplishments. It’s not easy, but it’s a way to control for recency bias. Use the examples and themes from the performance review to serve as context for more frequent feedback on an ongoing basis. Make feedback more like brushing and flossing and less like a root canal. 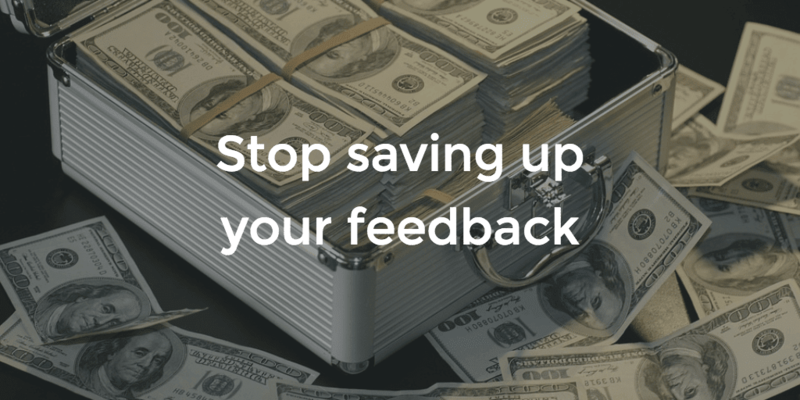 STOP SAVING UP YOUR FEEDBACK. We have to stop making the formal performance management review this big, scary, anxiety-inducing exercise. Feedback delivered in the formal review should never be a surprise. Instead of unfairly surprising people, start giving feedback in 1-3 minute bursts, immediately following the feedback-able event, and create a culture where feedback is the norm. And then, like mentioned above, the performance review can be a time to summarize the themes of the impromptu feedback that you’ve given over the course of the review period. You and your employee can check in on progress made in those areas and where to continue focusing. In many formal reviews, managers take time to ask, “Do you have any feedback for me?” I’m not a fan of this practice, mostly because I don’t think the employee’s review is the appropriate venue for this. It’s their review, not yours. The question also risks feeling like a lightweight manipulation, similar to the feedback sandwich. It can come across as the manager trying to make the employee comfortable, not really to solicit the employee’s feedback. It’s ***great*** that you want to get feedback from your employees. You should absolutely ask them what you can do to make it easier for them to work with you, but don’t do that in your employee’s performance review! Just like you won’t save up feedback for your employee for the performance review, encourage them to give you impromptu feedback. Review our handy, Andy Grove-inspired process for getting feedback, and commit to doing this on a regular basis — in your 1:1, for example. 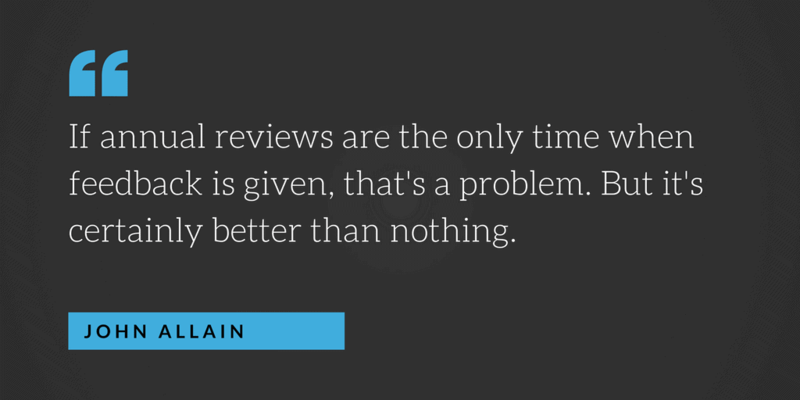 You should also make sure to regularly ask for feedback on your feedback. 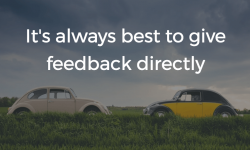 You’re giving frequent praise to help people know what to do more of and criticism to help people know what to do better, so it’s critical to understand how your feedback is landing for them. We recommend asking people to gauge your feedback regularly throughout the review process – not trying to squeeze this into the semi-annual review of your employee. You can use our product for this (stay tuned for v2!). So, to wrap up — the current approach to performance reviews is far from perfect. There are some key flaws with how they have influenced feedback processes in most companies. But if you’re aware of these imperfections and avoid common mistakes, hopefully you can maintain a great feedback culture and make performance review season a bit more enjoyable! What do you think? Can performance reviews be adjusted and saved, or should they be thrown out completely? Great article. I finished annual performance reviews last month, but want to plan for a better series of reviews this year with my employees. My biggest hurdle is adequately documenting the feedback over a period of time so that I have relevant, useful data when I do the two reviews where documentation and scoring is required (mid-year and final reviews). Any recommendations on how to document well, but in a way that is not overly cumbersome for a manager reviewing 20 people? Sorry for the delayed response and thank you for the question. I think step 1 might be to get fewer than 20 direct reports. I know this happens in some companies, but it really should be ephemeral. If you have 20 people in one team, it’s likely time to have 3 managers or so. I understand this is easier said than done. Not to put too fine a point, but 20 direct reports is not sustainable. I think a great, lightweight way to go about this is to have frequent in-person conversations and then document these conversations in Evernote. Think brief bullets, not paragraphs. Evernote makes it easy to organize notes, keep a running set of notes, etc. Google docs works, too, but Evernote is primed to be the perfect tool for this. On your documentation, you’re not going for a federal case. You’re going for memory jog for the annual review down the line. If you’re following my advice, maybe set up a template around the ‘themes’ you’ve articulated for each person and document in Evernote by 1) date of conversation and 2) theme. Not everything is important in the context of giving yourself data for annual review. Recognizing this idea – that not everything is important given your purpose – sets you free from unrealistic (self) expectation of writing everything down. You can keep a “Notebook” on each person and set up a simple copy and paste template at the top of the notebook. Open your Jeff, for example, notebook, make a new entry called 9 Jan 2017, after your 1-3 minute impromptu conversation, copy/paste the template from the top of the doc, and drop in a couple quick bullets. Evernote has an app for your phone, too, so you can do this stuff in between meetings, in an Uber, waiting in line, waiting on your waiter, in the restroom if that’s your bag, and all the other small pockets of time out there we can reclaim in the name of better leadership. Thanks again for the question – hope this helps. Also, worth mentioning that if it’s an annual review, critical feedback given 9 months prior to the review might not be very useful.